In this special guest post, Mario Sahe-Lacheante explains why cinemagraphs were his medium of choice on a recent trip to one of Europe’s largest refugee camps. His motion stills, captured inside the “Calais Jungle,” provide a powerful glimpse of life within the now-defunct camp. The European refugee crisis hits our screens on a daily basis with image upon image of people fleeing countries that have been crippled by war, conflict, and terror. With thousands of displaced people seeking a better life and with the belief that the UK is the best that they could hope to find, scores of refugees have made their way through Europe in a desperate attempt to reach a safe haven. For many however, the refugee camp in Calais was their last port of call. Here, many hoped to find a way to jump on buses, trucks, ferries, or even dare so much as to try to walk through the Eurostar railway tunnel or Channel Tunnel – with many, sadly, losing their lives. But for the thousands who became stranded in Calais, the refugee camp – a former landfill site just three miles from the centre of town – became their home. With poor conditions, improvised shelters and makeshift tents, many charities stepped in to provide basics such as food, clothing, hygiene supplies, medical aid, etc. For the past 11 months, my wife and I have had the privilege of being part of a team called Greenlight Medic, a social justice initiative of skilled volunteers and professionals who go out onto the streets of London to provide basic medical care. One arm of Greenlight was a refugee response initiative in the Calais jungle, to look after rubbish collection. Armed with litter pickers, gloves, face masks and hand sanitiser, groups of 40-50 volunteers would go over to the camp twice a month to spend 6-7 hours clearing rubbish and helping to make the camp a little more liveable. We initially went over in February but with a busy summer of work abroad, my second visit was only recently at the end of September – just a few weeks before the camp was demolished. It was tiring, dirty work but the visible change the team witnessed in the camp over the following few months, because of this work, was incredible, not to mention the knowledge that this work resulted in a cleaner living environment. So, in September, I swapped a litter picker for my camera and endeavoured to capture a few moments in Calais and bring them to life, thanks to the power of cinemagraphs. I believe that cinemagraphs are a powerful, relevant medium that can elicit a stop and stare ‘wow’ moment and at the same time evoke emotion, a stirring, passion, depth – some kind of response. Given the context of the camp, I wanted to be mindful and respectful so as not to create cinemagraphs “just because of a great opportunity” but rather, harness the chance to create a narrative that was different to the everyday journalism that was hitting our screens. Even more impacting to me were the stories from refugees who I, and others on our team, had the opportunity to meet. From a young boy called Abdim from Afghanistan who, at just 14 years old, had made it over to the camp on his own, to Maher, a young man who had no papers and no one in the world but a brother in Birmingham – stories such as these impacted me greatly. Cinemagraphs made sense for a few reasons – they’re easily shareable with a little text whether through Instagram, Facebook, on a blog, etc. Video, on the other hand, also requires more forethought and planning, which is sometimes not a luxury in a situation where you don’t know what you’d find, and also require a lot more work for sound, editing, story content, etc. – which would’ve proved tricky, given the time I had. Because of the movement that help set the tone or scene of a shot, I also believe cinemagraphs can be far more powerful than stills. Whether you’re describing the wind sweeping through makeshift tents, a pool of dirty water, or a fire burning away in the camp, a still could never capture all of it as well as a cinemagraph. Of course, you have to choose your tools. Cinemagraphs are a more artistic and time-hungry medium than stills, and if you were ever covering riots or situations that involved life threatening risks, a photograph might be all you have time to grab. 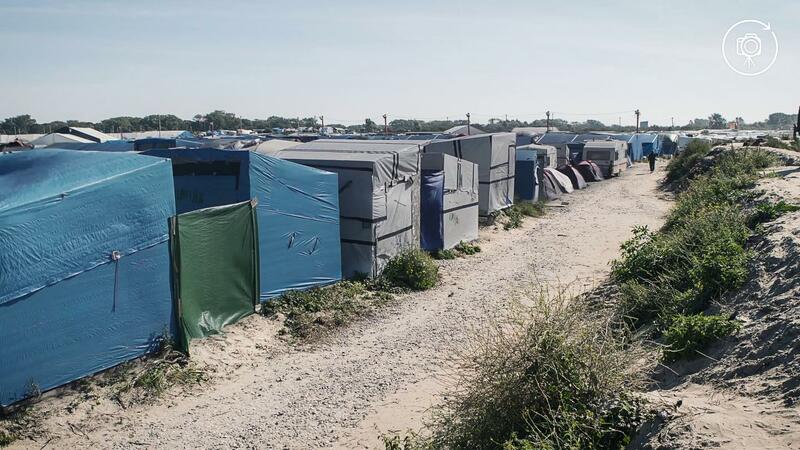 Since last month, the Calais camp has been closed. Various councils in the UK are dealing with some of the unaccompanied minors who were brought over from the camp and who now have to learn about life in the UK – even down to the basics of knowing how to switch on the lights or turn on an oven. If nothing else, I’m glad that the camp’s closure has hopefully given opportunity for people to be placed in better housing with the opportunity to start a fresh, safe life somewhere. For more of Mario’s cinemagraphs, check out his gallereplay profile! I’m a South African director of photography, working in the production industry in London, UK. I aspire to create cinemagraphs that are beautiful, that tell a story, and that would hopefully make even experienced creators wonder how they were made.